Gardening > Keep plants alive while you’re away from home! Keep plants alive while you’re away from home! If you plan to go away on holiday, fretting about what’s happening to your container plants is not the best way to relax! From self-watering containers to irrigation systems, there are plenty of ways to make sure you don’t come home to scenes of death and destruction on the patio. You can help plants right from the start by mixing water-retaining gel into your compost when you plant your containers up. Also, try to avoid using purely peat-based compost on its own in pots. As it dries out, it shrinks from the sides of the pot and is very difficult to re-wet. Any water heads for the gap between the pot and the compost and pours straight out the bottom! Combine multi-purpose with loam-based John Innes compost for a mix that is easier to keep moist. Terracotta pots look wonderful but because they are porous, they allow water to wick away. In hot weather, group these earthenware containers together to help keep moisture in. Metal and plastic pots hold water more efficiently but they can overheat, so it’s worth grouping them together in a shaded area before you go away. That said, don’t leave them in the ‘rain shadow’ of a wall or fence – they need to be somewhere they can catch rainfall. at the front of the house! Automatic irrigation systems are the best solution for worry-free watering. Once set up, they’ll deliver water where and when it is needed. 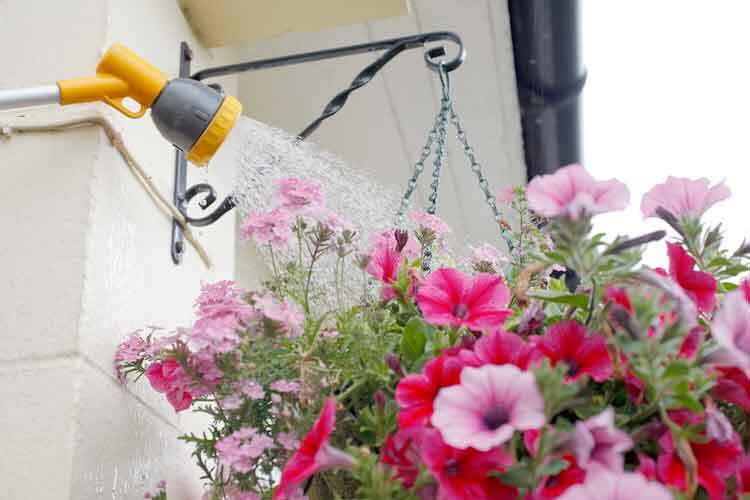 They’re ideal for containers and even better for hanging baskets or window boxes that are hard to reach. The kits carry water from a reservoir in slim flexible tubing that attaches to individual drippers positioned in each container – usually up to twenty at a time – and can be hooked up to timers on taps. Try Hozelock’s Aquapod and Darlac’s Maxi Drip Systems. Monkshood is known for being highly poisonous, but it’s an excellent deep indigo-flowered border perennial all the same. Just never eat it. This variety has white flowers that almost seem more sinister for their purity. Equally poisonous, so avoid it in gardens children visit. Garden News magazine is packed full of practical tips, inspiration, plant and product news and great money-saving offers! On sale every Tuesday, or subscribe and try your first four issues for just £1. Call 01858 438884 or visit www.greatmagazines.co.uk/YFIG. T&Cs apply.